When Chérie A. Smith took over Program Executive Officer Enterprise Information Systems (PEO EIS) in January 2018, she knew what to expect, having already served as acting deputy PEO for three months. The job is a sprawling task, overseeing more than 60 Department of Defense and Army acquisition programs that span the business, war-fighting and enterprise information environment mission areas. Previously, Smith was the deputy PEO for Simulation, Training and Instrumentation, a multimillion-dollar office with a staff of more than 1,200 military, government civilian and contractors. Smith says her mission these days is to tame the chaos: to streamline disparate networking programs, break down siloes as well as integrate information solutions. She’s reorganizing activities within the PEO while simultaneously building up network cyber defenses, using rapid acquisition tools to get small, nimble industry solution-providers onto the military radar. Smith recently spoke with C4ISRNET’s Adam Stone about her mission to integrate PEO EIS programs and her efforts to deliver agile, secure and unified networking across the Army. C4ISRNET: Give us an overview of PEO EIS and its priorities. CHÉRIE A. SMITH: We still have the overarching mission to rapidly deliver innovative and cost-effective systems and services for the total force, to globally connect the Army and provide that decisive information advantage to every soldier. The difference or the emphasis that I’m adding going forward is to bring these things together to achieve cost effective, integrated solutions and drive the cost down for the Army and improve the value as we move across the things that PEO EIS builds. C4ISRNET: So, you’re looking not just at innovation, but at the ability to integrate your innovations? SMITH: Right. If you think about all our programs, they grow up at different times, and there are different technologies and different capabilities available as the requirements are identified. Then we take them on to start to build, and then field them, and then sustain them. Do you know how the government fights drones? Now what we want to do is take the organization to the next logical step, which is to integrate across those platforms. Then we believe we’ll see that the seams, those gaps across the seams, will start to disappear. We can achieve all sorts of economies in that, having shared data and shared information, and providing common services that multiple program managers will use. All of that will get us savings and I think a better performance to the customer in the long run. C4ISRNET: How will you go about it? SMITH: I’m focusing our team on a couple of critical priorities. The first one is the talent management aspect. I mean, not just having the right people and the right skill sets, but also getting the workforce aligned with the vision. Each program manager has a charter and a set of funding. Now I’m really asking them to also look across to their brother and sister programs and think broader about how we can meet the Army’s needs. It’s about moving folks around to get those good ideas dispersed, to get those “lessons learned” dispersed. C4ISRNET: What do you need to do to make the networks more seamless and more integrated? SMITH: Some of that is what we’re calling unification. Think of it as identifying where we can put in common solutions and contracts. Maybe we want to leverage a solution already fielded in another PEO, like [Command, Control and Communications-Tactical]. Or maybe they want to leverage one of our programs so that, instead of having two or three different solutions to the same problem, with different sustainment tails, we now have one. Integration becomes easier if you’re integrating the same type of product. C4ISRNET: Along those lines, how are you re-organizing Installation Information Infrastructure – Communications and Capabilities [I3C2] and Defense Communications and Army Transmission Systems [DCATS]? We could probably collapse down into common contracts for some of this hardware. Not all of it, but some of the backbone pieces. We could share people who help do the acquisition documentation and all the regulatory paperwork and stuff that we have to do, because it’s similar activity. C4ISRNET: How are you approaching the defensive cyber operations? SMITH: PEO EIS is the office of primary responsibility for the defensive cyberspace operations for the enterprise network. 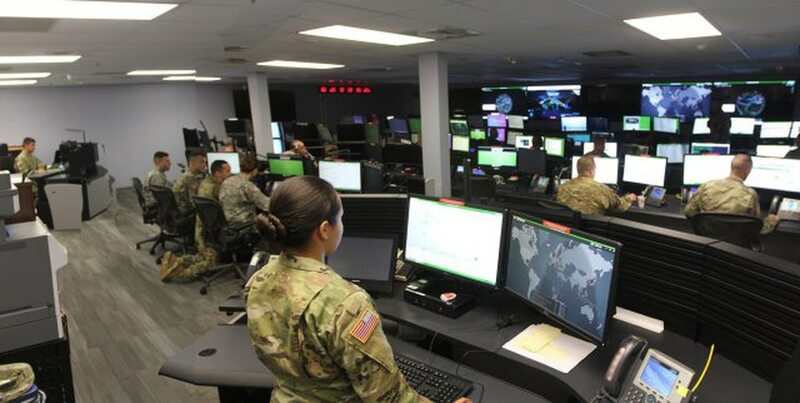 We have the non-tactical responsibility for defensive cyber operations, and our folks have been actively engaged in developing and employing those solutions and capabilities to counter the threats. So, on Dec. 29, we completed a materiel development decision, which basically established a program office under a lieutenant colonel, and he will have responsibility for the creation, at least initially, of what we think will be about 10 small programs of record, at the Acquisition Category III level. They will provide cyberspace analytics capabilities, commercial software tools for a cyber protection team, and that’ll give them the ability to discover, analyze, monitor and then counter threats coming into the system. C4ISRNET: In your first formal message to your team in your new role, you wrote that you rely on industry “to break the traditional molds, to think both creatively and strategically and to implement effective solutions to tough Army problems in real time.” How does that happen? SMITH: We’re going to use OTAs, other transaction authorities, which will allow us to very quickly move as technology moves. The thing in cyber is that the threat is constantly changing, so your ability to respond to the threat has to be able to change rapidly also. Through the OTA, [we are] leveraging the consortium. What do I mean by that? A bigger consortium has elements of academia; it has small, medium and large companies. So for a smaller company that doesn’t traditionally do a lot of business with the government — in the past, they really didn’t have a way to come to us. Now, through the OTA process, they can team up. And the larger company brings the experience, brings the auditable financials, knows how the government works. C4ISRNET: You’re also looking to enhance training. DCATS, for instance, recently launched a training simulator for operators of the Army’s Wideband Satellite Communications Operations Centers — the folks who manage the Wideband Global SATCOM constellation of satellites for military communications. What does the new training model offer? SMITH: This provides them a training environment where we simulate real-world scripts. It’s one thing to be sitting in a classroom and seeing a bunch of slides and somebody says, “If this happens, do that.” It’s another thing to actually be in, doing it, feeling what happens and having to respond to it and getting that feedback almost immediately. So they can emerge themselves into the simulator, as needed, to keep their skills refreshed, as well as to learn the skills initially. Probably what tickles me the most about this is I just came from PEO STRI [Simulation, Training and Instrumentation], and this effort is a collaboration between the two PEOs, PEO EIS and PEO STRI. C4ISRNET: You’re staring at so much technical and organizational complexity. When you try to align it all, what’s the biggest challenge? SMITH: The challenge really is that most people don’t understand how hard this is. You get a new Apple iPhone every year and you get all these new capabilities. And I hear, “Why can’t the Army do that? Why can’t I have my Apple-like solution?” But it’s a different level of cyber risk. It’s a different level of integration. There are concerns when you move data to one place that you’ve created vulnerability somewhere else. All of those things have to be worked. Federal Hot Take podcast: Too big to fail? Companies are far ahead of their peers, so who will the government turn to?